Look to use good Technique in Passing & Receiving using both feet for the first part. Look to make good angled runs after you've made the pass and open up your body to receive the pass back and lay the ball off again. Create space and make good angled runs creating space when the defender is introduced. 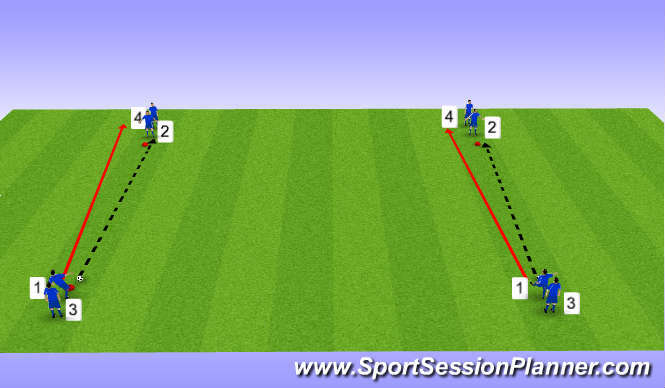 PROGRESS SESSION BY GETTING PLAYER 1 TO PLAY TO PLAYER 2, PLAYER 1 THEN MAKES A FORWARD RUN TO THE LEFT OR RIGHT OF PLAYER 2 THEN RECEIVES THE BALL BACK AND LAYS A FIRST TOUCH PASS BACK TO PLAYER 2. PLAYER 2 THEN REPEATS PROCESS WITH PLAYER 3 AND PLAYER 3 DOES SAME WITH PLAYER 4. KEEP DRILL FLOWING TRYING TO KEEP TO THE 1 AND 2 TOUCH ONLY. PROGRESS SESSION FURTHER BY ADDING A DEFENDER IN THE MIDDLE, GET DEFENDER TO JOCKEY BUT NOT TACKLE (MAKE A NUISANCE OF THEMSELVES). 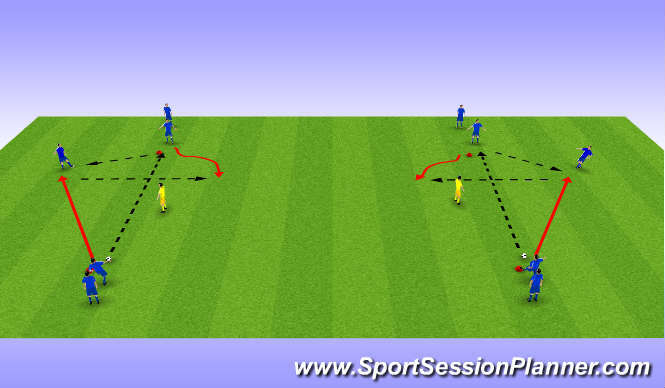 DRILL IS TO WORK BALL FROM 1 SIDE OF PITCH TO OTHER WITH LITTLE 1 AND 2 TOUCH PASSING. 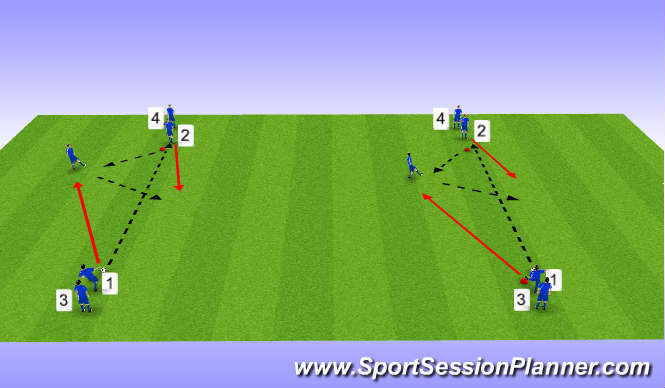 GAME PLAY SCENARIO, Play 5v2 or 5v3. Make the Team of 5 make 5 passes between each other before scoring in any of the 4 goals, If the team of 2 touch the ball then the other team are back to square 1 (the first pass..) If and when the team of 2 Win the ball they can score in any of the 4 goals straight away.. 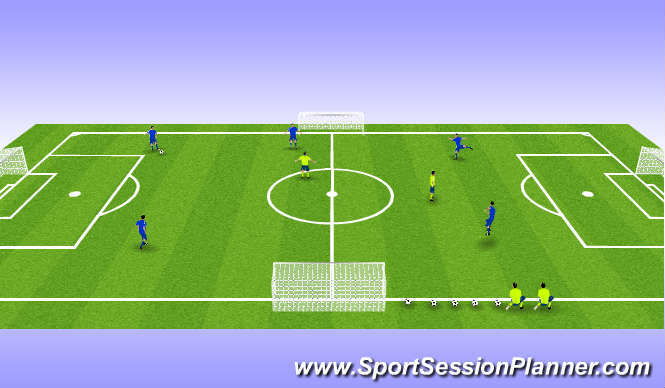 The quick passing, receiving and moving they have learnt in session should now be coached in game play.